Tobacco is a sacred plant of the indigenous people of North and South America. Traditionally it was ground and snuffed nasally in South America, whereas in North America it was smoked through a pipe. The centuries old act of pipe smoking was often a communal ceremonial act among fellow tribe members and between fellow tribes, additionally it was often used to seal a contract between fellow natives and early colonists. This precisely composed and masterfully executed human effigy wood pipe is carved from a solid maple burl and accented with lead inlay. The self-directed effigy is consistent within the Woodlands culture-with the bowl in hand, smoker and effigy communicate. The face is stylistically similar to this collection’s human effigy club with its well-defined features. 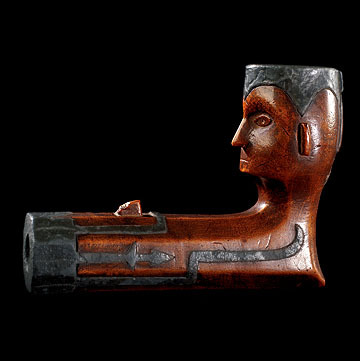 A pipe in the collection of the National Museum of Denmark has an earlier pipe with similar features—its eyes filled with lead. The lead inlay on the head of this pipe represents a headdress and is rocker engraved. Carbon remains within the bowl and the pipe is in a remarkable state of preservation, exhibiting a rich patina from use and age.